The quantity, size, and complexity of data center workloads increases almost every day. It’s crucial that those workloads run on compute, network, and storage infrastructure that is ideally tuned—and tested—to deliver optimized performance. 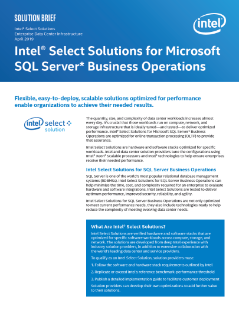 Intel® Select Solutions for Microsoft* SQL Server 2016 software provide that assurance. Siemens Healthineers, the global healthcare market leader in diagnostic imaging. The North German Supercomputing Alliance (HLRN) selected the new Intel® Xeon® Platinum 9200 processors. The Texas Advanced Computing Center (TACC) designs and operates some of the world's most powerful computing resources.